God Emperor of Dune is a science fiction novel by Frank Herbert published in 1981, the fourth in the Dune series. NY: G. P. Putnam's Sons, . First edition. A fine copy without dust jacket as issued, in cloth slipcase. (17100). Octavo, cloth. One of 750 numbered copies signed by Herbert. Fourth in the Dune saga. See Anatomy of Wonder 4-207. Seller: L. W. Currey, Inc.
New York: G.P. Putnam's Sons, 1981 Number 569 of 750 numbered copies signed by the Herbert on a special limitation page. The fourth novel in the "Dune" series. A fine copy within a fine example of the publisher's slipcase. Issued without a dust jacket.. Signed. First edition, first printing. Hardcover. Book. 2008-05-01. New. Ships with Tracking Number! INTERNATIONAL WORLDWIDE Shipping available. Buy with confidence, excellent customer service! New York: G.P. Putnam's Sons, . First edition. A fine copy in a fine dust with a tiny 7 mm closed tear to the upper right front panel, a touch of shelf wear to the spine ends and a new bookstore price sticker affixed to rear panel. (21730). Octavo, cloth backed boards. Trade edition. Inscribed by Herbert on the title page. The fourth in the Dune saga. Sargent, British and American Utopian Literature, 1516-1985, p. 407. See Anatomy of Wonder (2004) II-524. 1982-08-02. New. Ships with Tracking Number! INTERNATIONAL WORLDWIDE Shipping available. Buy with confidence, excellent customer service! Putnam, 1981. Book. Fine. Hardcover. Signed by Frank Herbert,putnam 1st edition,inscribed to former owner. True first printing stated on hardcover with jacket having price-fine/vg. G. P. Putnam¿s Sons, 1981. 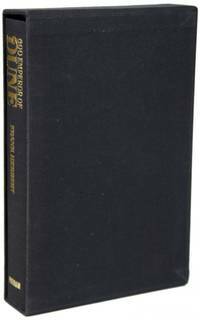 First edition, first printing ¿ no printing shown on copyright page, which according to McBride¿s Identification of First Editions is correct identification of first printings by this publisher until 1984. Price of $12.95 on dust jacket flap, and 8105 date code on front flap. Inscribed and signed by Frank Herbert. A rare signed true first printing ..
2008-02-07. Good. Ships with Tracking Number! INTERNATIONAL WORLDWIDE Shipping available. May not contain Access Codes or Supplements. May be ex-library. Shipping & Handling by region. Buy with confidence, excellent customer service! 1981-03-05. New. Ships with Tracking Number! INTERNATIONAL WORLDWIDE Shipping available. Buy with confidence, excellent customer service! New York: G.P. Putnam's Sons, 1981. Near Fine/Very Good. Third printing. Foxing on page fine edges, near fine in a very good dustwrapper with spine sunned, short tear on spine head with internal tape repair. Inscribed by the author on the title page. The fourth book in the Dune series. Ace. Hardcover. 0441016316 New Condition *** Right Off the Shelf | Ships within 2 Business Days ~~~ Customer Service Is Our Top Priority! - Thank you for LOOKING :-) . New. Ace Hardcover, 2008-09-02. Reprint. Hardcover. Used:Good. Very Good. G.P. Putnam, 1981 hardcover. SIGNED on the title page. Cover, binding, pages and dust jacket look almost like-new. Ace. Hardcover. 0441016316 New Condition. . New. Ace. Hardcover. 0441016316 Like New Condition. . Fine. 1987-08-01. New. Ships with Tracking Number! INTERNATIONAL WORLDWIDE Shipping available. Buy with confidence, excellent customer service! 2008-05-01. Good. Ships with Tracking Number! INTERNATIONAL WORLDWIDE Shipping available. May not contain Access Codes or Supplements. May be ex-library. Shipping & Handling by region. Buy with confidence, excellent customer service! 1984-01-15. New. Ships with Tracking Number! INTERNATIONAL WORLDWIDE Shipping available. Buy with confidence, excellent customer service! 2003-08-08. New. Ships with Tracking Number! INTERNATIONAL WORLDWIDE Shipping available. Buy with confidence, excellent customer service! Gollancz. First UK edition-fourth impression. Hardcover. Very good/Very good. VGC plus.Victor Gollancz,1984.First UK edition-fourth impression.Volume four of the Dune saga.Black hardback(gilt lettering to the spine) with Dj(a couple of creases and small nicks on the edges of the Dj cover),both in VGC plus.Nice and clean pages with a small mark on the outer edges,small pencil mark impression on the edge of the first blank page of the book.The book is in VGC with light shelf wear on the Dj cover.349pp.Price clipped.A collectable book.Heavy book. 1983-02-05. New. Ships with Tracking Number! INTERNATIONAL WORLDWIDE Shipping available. Buy with confidence, excellent customer service! 1987-05-01. New. Ships with Tracking Number! INTERNATIONAL WORLDWIDE Shipping available. Buy with confidence, excellent customer service! 1981-01-01. Good. Ships with Tracking Number! INTERNATIONAL WORLDWIDE Shipping available. May not contain Access Codes or Supplements. May be ex-library. Shipping & Handling by region. Buy with confidence, excellent customer service! 1984-01-15. Good. Ships with Tracking Number! INTERNATIONAL WORLDWIDE Shipping available. May not contain Access Codes or Supplements. May be ex-library. Shipping & Handling by region. Buy with confidence, excellent customer service! Ace. Hardcover. 0441016316 Please allow 4 - 14 business days for Standard shipping, within the US. Thank you for supporting our small, family-owned business! . New. 2008-09-02. Reprint. Ace. Hardcover. 0441016316 Please allow 4 - 14 business days for Standard shipping, within the US. Thank you for supporting our small, family-owned business! . Fine. 2008-09-02. Reprint. Ace. Hardcover. 0441016316 Ships promptly from Texas. . New. 2008. New York: G. P. Putnam's Sons. 1981. First Edition; Sixth Printing. Hardcover. 0399125930 . Very Good+ in a Very Good+ dust jacket. 1/4 inch open tear at top of rear panel. Foxing at top edge of text block. ; 8.8 X 5.8 X 1.8 inches; 411 pages . 1981-02-06. Good. Ships with Tracking Number! INTERNATIONAL WORLDWIDE Shipping available. May not contain Access Codes or Supplements. May be ex-library. Shipping & Handling by region. Buy with confidence, excellent customer service! 1994-07-07. Good. Ships with Tracking Number! INTERNATIONAL WORLDWIDE Shipping available. May not contain Access Codes or Supplements. May be ex-library. Shipping & Handling by region. Buy with confidence, excellent customer service! 1983-05-01. Good. Ships with Tracking Number! INTERNATIONAL WORLDWIDE Shipping available. May not contain Access Codes or Supplements. May be ex-library. Shipping & Handling by region. Buy with confidence, excellent customer service! Gollancz, 1984. This is an ex-library book and may have the usual library/used-book markings inside.This book has hardback covers. In poor condition, suitable as a reading copy. No dust jacket. New York, N.Y., USA: G. P. Putnam, 1981. 1st Edition . Hardcover. Very Good/Good. 8vo - over 7¾ - 9¾" tall. First Edition, Book Club Edition (BOMC) , no writing, marks, underlining, or bookplates. No remainder marks. Spine is tight and crisp. Boards are flat and true and the corners are square. "Good" dust jacket is not price-clipped, with many edge tears and wear. This " VERY GOOD" condition first edition/BOMC printing copy is protected with a polyester archival dust jacket cover. Still a nice collectible copy. Orion Pub Co. PAPERBACK. 0575075066 New Condition. . New. London: Victor Gollancz Ltd., 1981 The fourth novel in the Dune series. Fine in near fine, bright dust jacket.. First British edition, first printing. Hardcover. Book. New York: G. P. Putnam's Sons. 1981. Hardcover. 0399125930 . Near Fine in a Good dust jacket. Shelf wear and creasing to panels. Chips to lower front panel. Upward creasing to upper front and rear panel. ; 8.80 X 5.80 X 1.80 inches; 411 pages; Original unclipped dust jacket protected by archival Brodart cover. All domestic orders shipped protected in a Box. .
Putnam Adult, 1981-05-06. Hardcover. Used:Good. Berkley Trade, 1982-04-01. Paperback. Used:Good. Berkley Trade. PAPERBACK. 0425053121 New Condition. . New. Berkley Books. MASS MARKET PAPERBACK. 042508003X New Condition. . New. G. P. Putnam's Sons. Hardcover. 0399125930 New Condition. . New. Orion Pub Co. PAPERBACK. 0575075066 Like New Condition. . Fine. Berkley Trade. PAPERBACK. 0425053121 Like New Condition. . Fine. G. P. Putnam's Sons. Hardcover. 0399125930 Like New Condition. . Fine. Berkley Books. MASS MARKET PAPERBACK. 042508003X Like New Condition. . Fine. 1981-03-05. Good. Ships with Tracking Number! INTERNATIONAL WORLDWIDE Shipping available. May not contain Access Codes or Supplements. May be ex-library. Shipping & Handling by region. Buy with confidence, excellent customer service!